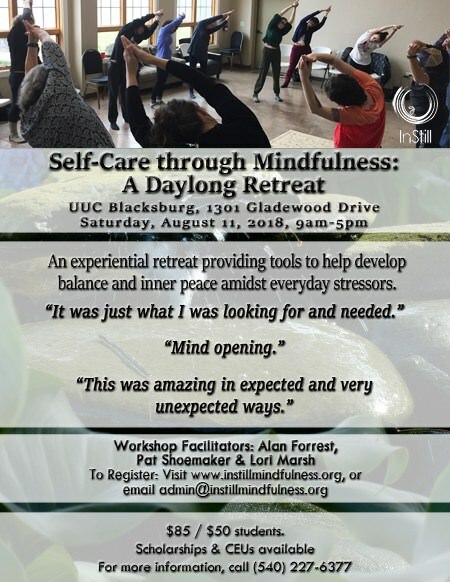 InStill Mindfulness SWVA presents Self-Care through Mindfulness: A Daylong Retreat on Saturday, August 11, 2018 at Unitarian Universalist Congregation in Blacksburg, VA. Registration, which includes lunch, is only $85.00 and $50.00 for students. Scholarships and CEUs are available. To register, visit https://instillmindfulness.org/blacksburg-daylong-retreat/ or email admin@instillmindfulness.org. To view the event flyer, visit: https://i.imgur.com/KTKU3Fy.jpg. For more information, visit: https://www.instillmindfulness.org or call 540-227-6377.